After discovering the fossil 100 years ago, an international team of scientists have announced a new species of horned dinosaur. The Spinops sternbergorum is a new species of dinosaur that lived 76 million years ago in southern Alberta, Canada. The plant eater weighs two tons and is a smaller relative of the Triceratops. 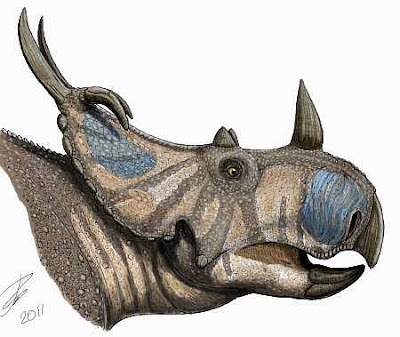 A single large horn projected from the top of the nose, and a bony neck frill sported at least two long, backward-projecting spikes as well as two forward-curving hooks. These unique structures distinguish Spinops from related horned dinosaurs. "I was amazed to learn the story behind these specimens, and how they went unstudied for so long," said Andrew Farke, Augustyn Family Curator of Paleontology at the Raymond M. Alf Museum of Paleontology, and lead author on the study naming Spinops. "This animal is an important addition to our understanding of horned dinosaur diversity and evolution," Farke continued. Father and son team, Charles H. and Levi Sternberg discovered parts of the skulls of at least 2 of these dinosaurs in 1916. They sent the fossils to the The Natural History Museum in London for further study. However, the fossils were deemed too scrappy for exhibit, and consequently were shelved for decades. It wasn't until paleontologists recognized the importance of the fossil that the bones were finally cleaned for study. "This study highlights the importance of museum collections for understanding the history of our planet," commented Farke. "My colleagues and I were pleasantly surprised to find these fossils on the museum shelf, and even more astonished when we determined that they were a previously unknown species of dinosaur." The name Spinops sternbergorum (pronounced "SPIN-ops stern-berg-OR-uhm") means "Sternbergs' spine face", referring to the headgear of the animal and honoring the original discoverers of the fossil. Although the face of Spinops is similar to its close relatives Centrosaurus and Styracosaurus, the unique anatomy of the bony neck frill gives scientists better insight into how this structure evolved. In particular, the fossils of Spinops clarify the identification of the long frill spikes common in some horned dinosaurs. Previously, scientists had inferred that these spikes evolved only once in the group. Careful study of Spinops, however, suggests that its spikes are located in a different position from that seen in most other horned dinosaurs, implying that the structures evolved independently. This finding allows a more accurate reconstruction of evolutionary relationships, and is being tested with additional study. Note: Along with Andrew Farke, an international team of paleontologists collaborated on the project, including Michael Ryan (Cleveland Museum of Natural History), Paul Barrett and Mark Graham (Natural History Museum, London), Darren Tanke and Dennis Braman (Royal Tyrrell Museum of Paleontology), and Mark Loewen (Natural History Museum of Utah). The research was funded in part by the National Science Foundation, and the paper formally naming Spinops appears in the December issue of the journal Acta Palaeontologica Polonica.